Sonus faber Venere 3.0 is new range-topping floorstander | What Hi-Fi? Italian speaker company Sonus faber has added a new flagship model to its Venere range. The Sonus faber Venere 3.0 is a 3.5-way, 1.16m-tall floorstander, and uses proprietary Sonus Faber drivers in a double-curved cabinet with a base and top-plate made from glass. 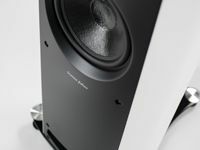 Staring from £2898 per pair when it goes on sale next month, the Venere 3.0 uses a 29mm ferrofluid-free silk dome tweeter, 15cm midrange driver and two 18cm bass units using the company's composite plastic Curv cones and 'free compression designed' baskets. Designed and engineered in Italy and made in China, where the company now has permanent technical offices at the production plants staffed by Italian technicians and carpenters, the speakers have a cabinet profile echoing the 'lyre' shape of the company's £79,000 Aida speaker, the double-curve adding strength and removing resonances. An inclined baffle is used to aid driver timing, and curved guides around the drivers control dispersion. The top of the enclosure is embellished with tempered glass, and the same material forms the base, into which the aluminium spikes screw. The Venere 3.0 has a front-venting reflex port, 90db/W/m sensitivity and 6ohm nominal impedance, and is designed for use with amplifiers of between 40W and 300W. It will be available in lacquered black or white at £2898 per pair, or £3198/pr in walnut veneer, through distributor Absolute Sounds' retail network.